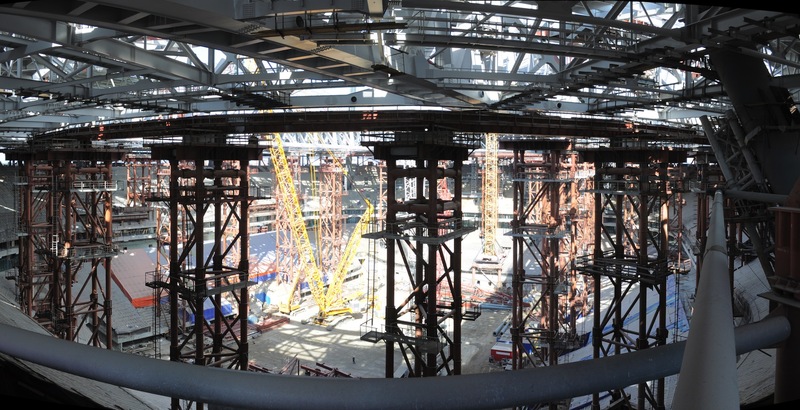 On the stadium in St. Petersburg being built by Transstroy company one of the largest construction stages, the metal structures installation of the fixed part of the roof, has been finished. At the moment the most complex technological stage is starting – the roof transfer from temporary support into the final position. The main installation works are to be finished by the autumn. One of the main stadium roof characteristics is its colossal size. The roof area of the future main city arena is more than 56 thousands sq. m. that is more than twice area of the Red Square. The installation of the fixed roof structure consisting of 16 blocks with the total weight about 18 thousand ton took a little more than a year. Up to 600 men working round the clock and more than ten special-purpose vehicles including those with carrying capacity of 650 and 750 ton were involved in the process. For the fixed roof installation the sliding technology was used usually used in bridge construction and meant for working with superbig structures. For the block transfer from the building slip unique extra fine machinery allowing moving blocks into the final position and obtaining high assembling accuracy was used. After finishing work on metal structures Transstroy proceeded to the new stage that is cable tensioning. After that the retractable roof segment installation will follow that is to be finished by the autumn. The stadium roof is one of the key points of the project. The stadium will be the only one in Russia and one of the few stadiums in the world equipped with a retractable roof. It will allow the stadium to be used all year round both as a sports arena and as a concert and exhibition space. The temperature inside the arena will not be lower than +7°С regardless of the weather. To create such conditions apart from the roof the stadium with the great bowl of 5 million cub. m will be equipped with all-powerful utilities. At the moment most of the general utilities, finishing coat and arena stained glass windows are already installed. Stand furnishing, installation of the elevators, escalators, roll-out field machinery, primary access control zone outfitting and stadium infrastructure development are in the active phase. Main construction works on the site are supposed to be finished by the end of the year; the whole construction will be completed by the end of 2016.